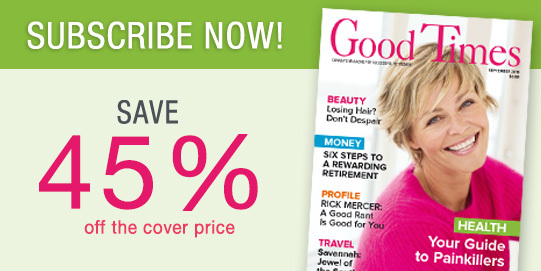 Each month, Good Times offers advice regarding your rights and keeps you informed about what's new in the world of health. With its features on travel, gardening, fashion, celebrities, and people just like you, it makes for a very good read indeed! I would like to receive communications from Good Times, a property of Senior Publications Inc., including newsletters, updates, promotions and special offers. I would like to receive special offers, promotions and contest information from Senior Publications Inc. and its affiliates. I would like to receive special offers, promotions and contest information from carefully selected partners of Senior Publications Inc.
Make life easy on yourself. By choosing this option, you’ll keep on receiving your magazine, without interruption. Each year, when your subscription is renewed, you will receive a bill for the special rate in effect and your magazine will be delivered to you for another year. You’ll save time and paper. You may cancel this service at any time by communicating with our customer service department. Why do we ask you that? This information will help us provide you with the best offers for you.